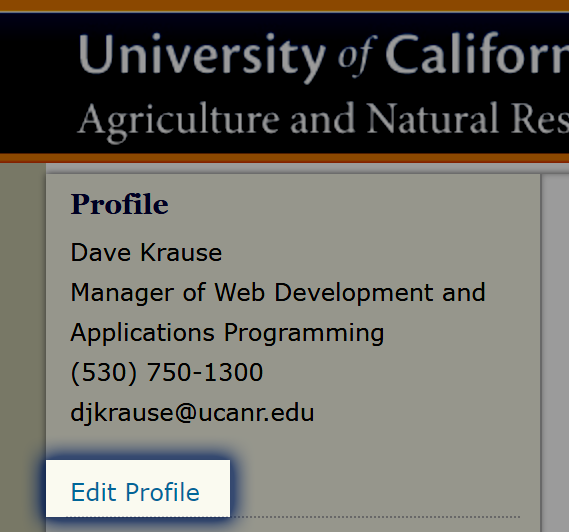 You may have noticed a link to “UCANR Active Directory (Beta test)” on the UC ANR Portal login page. The link was a test of our effort to manage staff computing credentials which are separate from UC Davis and other campuses. We created this new process in support of UC's transition to a new personnel system called UC Path. This system is scheduled to launch for UC ANR in March, 2019. Our beta test of this new authentication service is now complete, and we are preparing to launch it. While we don't anticipate a disruption in access to critical services and applications, please review the following information to ensure you understand what we need you to do now, how you may be affected and what you can do if you encounter any difficulties. In order to access the new UC ANR authentication service, you must reset your password in the ANR Portal before May 29, 2018. This will set up your password on the new service so that you can login to the new authentication service. You can reset your password by clicking the “Edit Profile” link on the upper left side of your ANR Portal. From there, you will see a “Change Password” link on the left navigation. Please read the new password requirements before attempting to reset it. If you need assistance, please contact us at help@ucanr.edu. If you log into the Portal using your ANR account, as highlighted below, you will have normal access to the tools provided by ANR. This does not include access to any tools operated by UC Davis, such as Kuali Financial System or the timesheets. UC Trust is a program which allows services and applications provided by different campuses and divisions to be easily accessible. If you login with any of the UC Trust links, you will have normal access to the tools provided by ANR, just as if you used your ANR Account. However, depending on which link you use, your access to systems supported by other locations will change. For folks using UCOP, UCR and UCB links, you will get access to the Portal and any services you are authorized to receive from your locations. For folks using the UC Davis or UC ANR links, there are key differences which are important to understand. If you have a UC Davis email address, you can use the UC Davis link will log you into the ANR Portal and UC Davis Central Authentication Service. This will grant you access to any UC Davis services and applications you are authorized to use. This includes timesheets for ANR employees who are not located at UCOP or another campus besides UC Davis. It also includes other systems like KFS, Box and Office 365 for folks with UC Davis email accounts. UC Path – services and applications required for the implementation of UC Path, as well as access to UC Path, will all use the UC ANR authentication services. More details about these services, and how they will impact ANR personnel, will be release shortly. Site Improve – a new accessibility and website quality assessment tool being rolled out UC-wide. It's still in beta testing, and we will send a separate email when access is arranged for key website administrators. SharePoint – ANR has an instance of SharePoint provided by UCOP. It is currently being tested with several administrative units. Additional services and applications will be announced and introduced over time as well as transitions of key services currently provided by UC Davis. If you require any assistance with resetting your password, encounter any issues logging into the different accounts, or if you have any questions or comments about the new authentication service or UC Path, please contact us at help@ucanr.edu.